One day, #Israel and its supporters will realise that fact, and peace and justice will follow. Until then, the heroic Palestinians remain anything but victims in my eyes. So please don’t give them your tears. Don’t cry for #Gaza. The angelic face of Gaza’s youngest martyr should serve as a reminder to us all about the ongoing brutality of the murderous Zionist machine that is Israel but whatever you do, don’t waste your tears on the Palestinians. Having travelled to the West Bank and Gaza and visited Palestinians in the many and numerous refugee camps in neighbouring Middle East countries, what I can tell you is that these amazing people don’t want your tears … they want justice. If you can’t help deliver it then at least cheer them on from the sidelines as they stand up and resist a brutal occupation. Some of them will pay the ultimate price in trying to get their freedom but they do not want your pity. On the eve of Ramadan instead of preparing for the most important month in the Islamic calendar, the people of Gaza were burying their dead … more than 60 and with over 2,500 injured the death toll could easily rise. The youngest martyr was eight-month-old baby Leila Al-Ghandour. She died as a result of inhaling tear gas fired by Israeli soldiers who have no qualms about targeting babies with their deadly weapons. In the 2014 war 495 were children and 253 women were killed by the Israeli war machine. The favourite method of killing, judging from the horrific injuries inflicted on the peaceful protestors this week, is a bullet in the back from Israeli snipers who picked off their targets like the cold blooded assassins they are. The rhetoric which then followed from various Israeli politicians was bordering on obscene. They referred to the Palestinians as victims of Hamas manipulation and “incitement” while treating news presenters as useful idiots ready to accept the twisted narrative churned out by the Zionist propaganda machine. The reality is the tens of thousands of Palestinians — young and old, women and children — who left their homes on Tuesday morning, knew fine well they might not return. But the people of Gaza are prepared to pay the blood price and they know the cost is high when it comes to resisting their chief tormentors and generally violent, psychopathic neighbours. 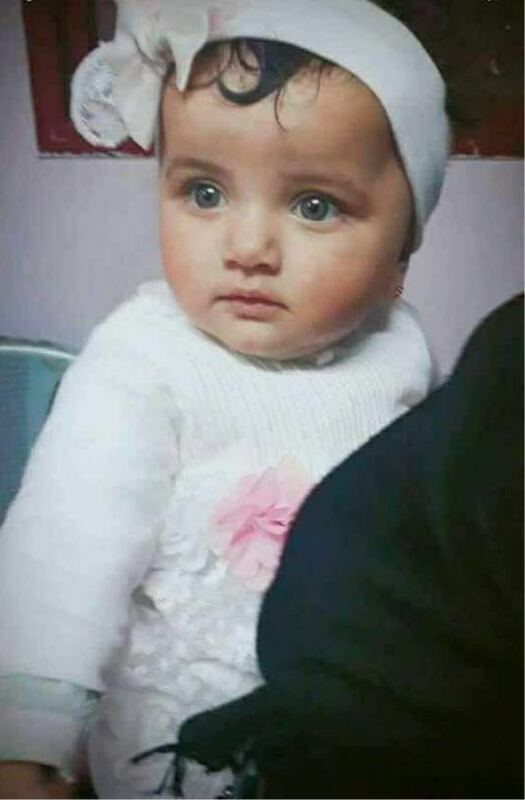 Israel has previous form for aggressive behaviour and a history of lashing out, no matter that this might mean mowing down babies like Leila. Despite this for the last six weeks a tidal wave of protestors, armed with nothing more than sticks, stones and slingshots have stood against the fourth largest army in the world in terms of advanced technology and weaponry. Very few armed forces in the world today have the superior firepower of Israel on land, sea or in the air. Israel even has nuclear weapons — the elephant in the room in all the recent verbal garbage spouted from Tel Aviv about the Iran nuclear deal. It beggars belief that Israeli politicians stood on the Golan Heights slagging off Iran for occupying parts of Syria. The truth is neither Iran or Israel should be in Syria. I’ve stood on the so-called border of illegally occupied Golan and looked at the huge swathes of Syrian lands, including three Syrian villages, still occupied illegally by Israel. In fact I’ve stood on a few barbed wire borders from Lebanon as well where Israel maintains an illegal occupation, and then of course there’s the occupation of Palestinian lands. I defy any cartographer worth his salt to draw a map of Israel. It’s mission impossible because land-grabbing Israel has no borders and refuses to be defined by maps of the region. In fact the geography books used by Israeli school children show a land from the River Jordan to the Mediterranean sea. But I digress. Returning to the Palestinians of Gaza, I want you to ask yourself what would make you go out and face down the barrel of an Israeli gun? Not only does it takes supreme courage, true grit and determination it also takes a burning sense of injustice and a determination to be free from occupation. The Palestinians in the besieged Gaza Strip do it not because they are told to by Hamas, Islamic Jihad or any other faction in Gaza. They do it because they are fired up by an unquenchable thirst for justice. The cold truth is Hamas could not have stopped the Great Return March even if it wanted to! What extremists? It seems while Israel holds the Palestinians under a military occupation it holds Westminster under a political occupation so much so that some politicians are blinded by the Palestinians desire for justice and freedom. It’s not rocket science. No one is being “exploited”; ordinary human beings just want to return to their lands stolen from them so unjustly and brutally 70 years ago. That is the refugees’ legitimate right, guaranteed over the decades and enshrined in international laws and conventions. The Palestinians don’t need extremists to crank them up and send them to the Israeli borders demanding the right of return; the brutal Israeli occupation does that all on its own. On Tuesday more than 60 Palestinians paid with their lives for their beliefs. They will not be returning home. They will be buried by their families and friends having acquitted themselves with honour in the service of their people. The funerals began on Nakba Day marking the ethnic cleansing of Palestine ever since 1948. Israel was born 70 years ago out of Zionist terrorism and violence targeting the Palestinians and the British Mandate authorities. Today the blood of innocent Palestinians is still being spilled and it will continue to flow until justice is served. I with someone would sit the British Foreign Secretary down to check the mind-boggling statistics and then he might begin to understand why these fearless people go willingly into the crosshairs of the cowardly Israeli snipers hiding behind posts 100 metres away. Seventy years ago, 750,000 Palestinians were dragged out of or fled from their homes built on land that generations of their families had owned and farmed for hundreds of years. The Palestinians owned more than 90 per cent of historic Palestine when the UN decided to partition it in 1947 and give 56 per cent to a Jewish state. Despite the lies taught in Israeli schools, “Palestine” existed as an entity and has done for centuries. Indeed, it was first mentioned by name in the 5th century BC in Ancient Greece, when the historian Herodotus wrote in The Histories about “Syria and Palaistinê” which he said lay between Phoenicia and Egypt. The founders of Israel thought that the 750,000 Palestinians would soon disperse and that the older generation would die off, while the younger generations would forget about their homeland. However, having become refugees overnight, successive generations have remained consistent in their determination to return to their land. The 750,000 have now grown to around 7 million Palestinian refugees in the diaspora and at least two million live inside the Gaza Strip. When the inevitable condemnation of Israel erupted around the world, it didn’t just come from pro-Palestine activists. Some Israelis also gathered to protest in Tel Aviv their army’s murderous action and while they will never be shot at with live rounds from an Israeli sniper, it is not an easy thing to do in a country in the grip of rightwing fanatics. The empty rhetoric spouted in Jerusalem by Trump’s evangelical supporters will soon be forgotten, unlike the demand for the right to return which grows stronger by the day in Palestine. Three-quarters of a million Palestinians fled their homes in 1948 in the belief that they would be able to return after a few weeks. Their determination to do so was unwavering and it remains so to this day. The evidence is very clear that not even Israel with its ethnic cleansing policies and state-of-the-art weaponry can hope to put an end to the Palestinian resistance. One day, Israel and its supporters will realise that fact, and peace and justice will follow. Until then, the heroic Palestinians remain anything but victims in my eyes. So please don’t give them your tears. Don’t cry for Gaza.